Lock in a great price for Hotel Philippos – rated 8.1 by recent guests! The person on the front desk was really smilly and nice. Bed was fine, quite comfy and the room was very good looking overall. AC, TV and a mini fridge included. Staff very friendly and helped us with all enquiries. Breakfast was ok, but I think it could be better (i.e. more variety) for the money. This is our second time staying at Phillips, the staff is always helpful and the location is great. Great balcony view. Great breeze from the port, so we didn't end up using the a/c. The staff were very friendly,fairly good Location and nice Breakfast ! Location was perfect for our early ferry to Skiathos and we were able to park very close to the hotel for free overnight. The staff was very polite and helpful, the hotel was placed near one end of Volos harbor, so it was in walking distance from everywhere. The room was clean and they offer to keep my luggage after checkout, until my departure from the the city. Hotel Philippos This rating is a reflection of how the property compares to the industry standard when it comes to price, facilities and services available. It's based on a self-evaluation by the property. Use this rating to help choose your stay! One of our top picks in Volos.This city hotel offers air-conditioned/heated rooms in the city of Volos. The Municipal Theater and the port are a just block away. The Hotel Philippos’ rooms are spacious with private bathroom. Each is equipped with an LCD TV, free Wi-Fi, mini fridge and safety box. All units have private balcony with mountain or city view. The hotel’s strategic location offers easy access to the Rigas Fereos Square.Hotel Philippos is on the coastal road with park areas, cafes, taverns and the main commercial road of Ermou nearby. Public parking is possible next to the hotel. When would you like to stay at Hotel Philippos? Air-conditioned room with a flat-screen TV, mini fridge and private balcony. 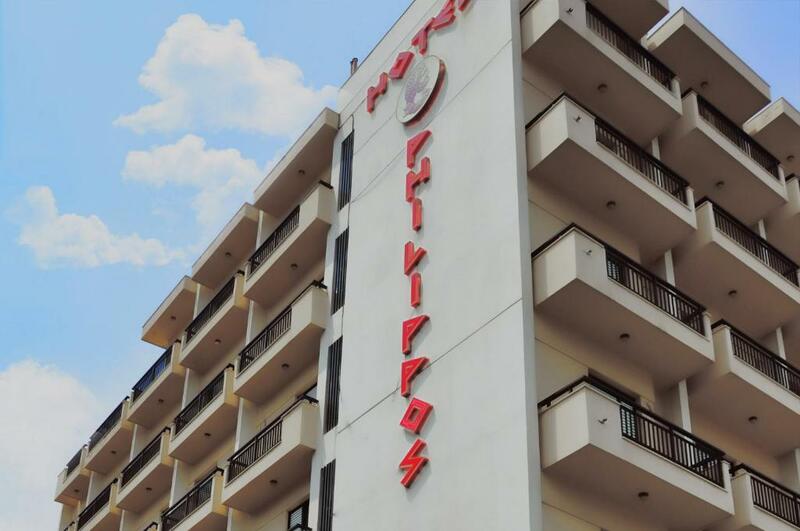 Whatever the reason you are visiting Volos, Hotel Philippos is the best starting point for either business or leisure purposes. House Rules Hotel Philippos takes special requests – add in the next step! Hotel Philippos accepts these cards and reserves the right to temporarily hold an amount prior to arrival. Bread at breakfast a little dry. Very convenient location . Good value for money. The hotel has issues with soundproofing especially with outdoor doors in the corridor. You can hear Every step and in general all the noises. They said that they are pet friendly hotel but it’s really possible to have issues with complains. Dissent. The bed was comfortable. Reception staff helpful, but not over friendly. We weren't made aware until arriving at the hotel that parking cost 50 cents per hour after 9am. Clean and a very good price. Everything was cool! It might have been easier for me to have a power plug for charging my cell phone closer to bed. Please notice that there IS a power plug, which I succesfully used, under the TV set. We book this hotel everytime we need to take the ferry in the morning; it's very close to the port and it's perfect for a 1 night stay. The staff is always nice. You can easily find a parking place in front of the hotel. I don't think you can complain about anything giving the price you pay and what you're being offered. Good quality for the money paid.very clean and close to the port.helpful staff.is perfect for one night stay. Noise coming from the street, really loud and unpleasant crying/yelling child in the middle of the night with no reaction from the staff, fighting German couple on the floor. The lighting in the room and bathroom was dead and bleak.